Actually, there is so much more research being done, especially in Europe, that I can barely keep up, so I have selected what I believe to be the best. You will see Michael Pluess’ name on several. He is at Queen Mary University in London, along with Francesca Leonetti, a postdoctoral student studying with him. They are doing great research, finding new angles to SPS (which is the term used in scientific contexts for your trait), developing the HSP Scale in various ways, and adding new points to what we know. We are so glad they are moving forward in this way. It takes some of the weight off of Art and me, as we see quality research being done without us! First I will discuss articles in which I was one of the authors. The “Relationship between the Temperament Trait of Sensory Processing Sensitivity and Emotional Reactivity” was published in 2016, in the journal Social Behavior and Personality. The first author is Jadzia Jagiellowicz, along with Art and me. It is based on data Jadzia gathered while at Stony Brook University. (She is now in Cambridge, Ontario. https://www.highlysensitivesociety.com/ ). 96 participants (1/2 HSPs and 1/2 those especially low on the HSP Scale) rated standard emotional-arousing pictures for how positive and negative they seemed and how aroused the participant was by looking at them. HSPs rated the pictures, and especially the positive ones, as significantly more intense emotionally. They also responded faster to the positive pictures. HSPs who reported having high-quality parenting also reported greater arousal in response to positive pictures than those low in sensitivity. These results give us some insight as to why HSPs exhibit “differential susceptibility,” suffering more in bad environments but doing especially well in good ones. It seems that in good environments they may pay more attention to positive stimuli relative to negative and react more strongly. This is even more so if they have had good parenting, when they must have paid particular attention to positive experiences, probably some of them quite subtle such as a parent’s slight smile of approval or delight. on Neural Responses to Emotional Stimuli” by Bianca P. Acevedo, Jadzia Jagiellowicz, myself, Robert Marhenke, and my husband Art was just published (actually “in press” at this moment) in Clinical Neuropsychiatry. It is kind of a sister study for the one above, using 14 participants, women as it happened, half very high and half very low on the HSP Scale, and finding very similar results, but using a different method, measurement of brain activation. This is a case of triangulation—getting the same result with different methods, which is especially appreciated in science. The 14 women were viewing positive and negative images as compared to neutral ones, as in the last study, and took the same measure of quality of childhood parenting. I will not recite for you the technical names for the areas of the brain activated, but in each case these are the areas that were different for those who were high versus low on the HSP Scale. For all images, not surprisingly to us, HSPs compared to the others showed more activation in areas associated with emotion, emotional memories, and emotion processing. For positive pictures (compared to neutral ones), SPS was more associated with areas involved in reward processing, self-other integration, calm, and satiation. This was even more the case the happier the childhood. For negative images (compared to neutral), some of the areas were the same (having to do with processing generally) but others were as you would expect with negative emotion, but again, many areas were different or increased for HSPs. However, a result of particular importance was, again, how much viewing the negative images was affected by having a better childhood, in that there was more activation in areas involved in emotion regulation and self-control. In sum, throughout the study, HSPs showed more brain activation while looking at the emotional pictures, just as they showed more arousal or emotional responsiveness in the study above if they had had good childhoods and were also more affected by poor ones. But the huge importance of this study and the one above is that they further validate differential susceptibility—that is, HSPs benefit more from a better childhood and are harmed more a poorer childhood. We can imagine the “harmed more” effect, but these studies allow us to see how positive environments really do lead to a deeper processing of positive stimuli in HSPs. In addition, such a childhood increases especially strongly their self-awareness, arousal, self-control, and calm, which are so important when responding to any emotion-laden situation. What if you grew up in a poor environment? Overall, HSPs also respond more to positive interventions. See the first study under “studies we were not involved in.” I am sure that this greater positive reaction will extend to psychotherapy (if the therapist provides a positive environment) and probably many more “interventions.” I predict that will include simply learning you are highly sensitive and that in many ways there is nothing wrong with you, since so much harm can be done in childhood by parents not understanding your sensitivity. So perhaps you are already living in a more positive inner and hopefully outer environment. Remember, your childhood need not cause you to feel one down. Environmental Sensitivity in Children: Development of the Highly Sensitive Child Scale and Identification of Sensitivity Groups was by Michael Pluess, Elham Assary, Francesca Lionetti, Kathryn J Lester, Eva Krapohl, plus me and Art (complex studies often have many authors, each with their own expertise and contribution). It was published in Developmental Psychology (a particularly prestigious scientific journal). This study is rather statistical, but partly involved creating a short 12-item HSC scale for children and adolescents. What was mainly important to us, although probably not to most of you, was that we were able to do a “bifactor analysis,” in which we found three factors (sets of items that group together) plus clear evidence for one overarching factor of plain old sensitivity. The three are (a) Aesthetic Sensitivity (e.g., being deeply moved by arts and music; having a rich, complex inner life, being conscientious); (b) Low Sensory Threshold (unpleasant sensory experiences–e.g., reaction to bright lights and loud noises; avoiding violent media); and (c) Ease of Excitation, referring to being easily overwhelmed–(e.g., being negatively affected by having a lot going on or by being hungry). The three factors have been made much of by other researchers, even though the researcher originally finding them also said the single inclusive factor was very present as well. Sub-factors of course can only sort the items in the scale. In my original interviews from which we constructed the scales, of course I heard more about the most noticeable part of being HS, being easily overwhelmed and to some degree noticing subtle stimuli—the “O” and “S” of DOES. I had not yet conceptualized the trait as having four aspects, DOES, with “D” for depth of processing and “E” for emotional responsiveness and empathy so they were largely left out and certainly not identified as such at that time. It is much harder to learn from interviews about D and E.
Actually, the 6 items of the “Aesthetic” factor are more about depth of processing, but the researchers understandably did not see that. Besides the 3 items above in parentheses—being deeply moved by arts and music; having a rich, complex inner life; and being conscientious—the aesthetic sensitivity group of items includes knowing what to do to make people more comfortable in an environment, being aware of subtleties, and noticing fine scents, tastes, etcetera. You can see why it might seem more like something aesthetic, but what about the item about conscientiousness? A deep inner life? Oh well. There is actually only one item for empathy (do others’ moods affect you, plus maybe noticing in a physical environment what needs to be done to make it more comfortable). We had some good items that did address emotion and empathy and that were strongly associated with the other items, but not quite as strongly so they were not included. We just did not see DOES back in 1996. Back to this study, another very interesting finding was the existence of three distinct groups with different levels of what Michael Pluess likes to call environmental sensitivity. Every living being needs to be sensitive to its environment, but as we know, about 25-35% are highly sensitive (the uncertainty of the % is due to different samples). There’s a group in the middle (approx. 41-47%), whom we can say are the “medium sensitive.” Then there is a low group (20-35%). They are probably the ones with whom we HSPs especially struggle! The following studies we were not involved in. One of the most exciting studies to date is “Sensory-Processing Sensitivity Predicts Treatment Response to a School-Based Depression Prevention Program: Evidence of Vantage Sensitivity.” This was done by Michael Pluess and Ilona Boniwell and published in Personality and Individual Differences. As the title says, there was a depression prevention program for 11-year-old “at risk” girls in a poor neighborhood in London, and the HSP Scale was among other measures given to them before and after they went through the program. The goal was to prevent these girls from becoming depressed over the next year, which often occurs to girls around 12 or a little older. The result? A year later the researchers found that the prevention program successfully reduced depression scores only for the girls in the top one third of scores on the HSP Scale. It was not effective at all for low-scoring girls. This is another example of how HSPs pick up especially well on good things, probably in this case by processing the program’s information deeply. This gives us real hope that an intervention can help us if we need it, even more than it would help others. “Sensory Processing Sensitivity as a Marker of Differential Susceptibility to Parenting” was published in Developmental Psychology (remember, this is a highly respected journal), reporting a study by Meike Slagt, Judith Semon Dubas, Marcel A. G. van Aken, Bruce J. Ellis, and Maja Dekovi´c. (All but Ellis are from the Netherlands). They studied kindergarten children who had been identified by both parents and teachers as having either high negative emotion or high SPS. (Negative emotion has long been seen as the main reason for differential susceptibility.) Mothers also reported on their parenting behavior using standard measure for parents, and teachers rated the children on certain behaviors (for example, having a “hot temper,” being easily distracted, or being especially considerate). The mothers and children were measured three times over seven months, allowing for studying changes over time. The results are a bit complex, but basically associations between parenting and child behavior did not depend on children’s negative emotionality. Sensory processing sensitivity, however, interacted with both changes in negative parenting and changes in positive parenting in predicting negative behavior seven months later, so that improvements in parenting led to less negative behaviors and parenting becoming more negative led to more negative behaviors, all much more so in HSCs. (For some reason the exact opposite was true for children who were not HSCs.) Why changes gave the only results may be because HSCs tend to adapt to the parenting (in this study, mothering) they are receiving, whatever it is, but have more trouble—get angry, distracted, and so forth at school—if their mother’s behavior changes. (SPS and parenting was not related to positive social behavior. One reason may be that these children, whether HSCs or not, did not vary that much on positive social behavior, coming from a relatively high socioeconomic level. Perhaps, for many possible reasons, children from poorer or less educated families have less chance to learn these behaviors.) The authors conclude that, depending on the interaction, there was support either for the idea of differential susceptibility (“for better and for worse”) or vantage sensitivity (just “for better”–HSCs simply benefited more from a positive environment). Here is still more evidence for SPS leading to differential susceptibility, this time from children, not adults reporting about their childhoods. The long-standing importance of negative emotionality, mainly in infancy, did not support differential susceptibility applying to this trait, as it had in the past. This is almost surely because signs of negative emotionality in infancy was mixed up with SPS. That is, some of the “negative” infants were negative only due to being overstimulated and parents not understanding their child’s needs. Sometimes infants were tested in the laboratory for negativity, by seeing their reaction to being held down or pricked with a pin on the foot! I remember shortly after beginning this research going to a conference on temperament and nervously standing up to suggest, after someone presented a study on negative infants, that maybe this negativity could sometimes be caused by sensitivity. I added that labeling infants as negative might be misleading or sometimes even harmful for all involved, but no one got it at the time. Years later, here is an excellent study that addressed this. When the two behaviors were separated out in kindergartners, of being negative (easy to observe) and behaviors suggesting sensitivity (a little tricker to see and something parents had not been asked about much in the past), SPS was clearly the stronger predictor. How satisfying. The next study was about “Sensory-Processing Sensitivity, Dispositional Mindfulness and Negative Psychological Symptoms,” done by Kaitlyn Bakker and Richard Moulding in Australia and published in Personality and Individual Differences. They noted that SPS is often associated with depression and anxiety, but perhaps there are things that moderate those effects. Hence they measured mindfulness as a trait (not as a practice, but as the ability to attend to and be accepting of present experience). They found that while in general SPS was related to higher levels of depression, anxiety and stress, with respect to anxiety, when mindfulness and acceptance were high, HSPs were not particularly anxious. It is easy to see how staying in the present helps us handle our emotions. Indeed, I wrote about another article about the research on handling our emotions [http://hsperson.com/emotional-regulation-and-hsps/], based on an article by the same author. Why did this attribute of being mindful not affect depression and stress? There are several possible reasons. But I am promoting a couple of reasons right now. First, no one’s studying typical or normal highly sensitive people yet. Unless someone knows they are highly sensitive, they are living under a burden. And people in these studies generally do not know. So they are going to report greater stress because they do not yet know how to take care of themselves. They may be more depressed because they think and have always thought something is wrong with them. So I hope someday soon there will be a study of the effects on stress a year after HSPs learn about their trait and receive some good advice about it. I think that in a year, many of these HSPs will have self-corrected and have fewer problems. My other concern about the many studies finding HSPs are more stressed, depressed, etcetera than others is that these measures were validated on 100% of the population, meaning that the “other 80%” are the largest contributors to the norms. They are the mean score, the average, so that HSPs are “too high.” I don’t know the answer to that yet, except being aware of it. The next article, “A novel Differential Susceptibility framework for the study of nightmares: Evidence for trait sensory processing sensitivity,” was by Michelle Carr and Tore Nielsen and published in Clinical Psychology Review. It did not report new data, but based on other research proposed that SPS might be a good way to think of nightmares. As the authors explain, research on nightmares has largely focused on the nightmare itself and its associated negative consequences, framing nightmare sufferers as victims of their difficult past and the resulting psychopathology. However, there is evidence that frequent nightmare recallers are sensitive to a wide range of sensory and emotional experiences, and report vivid, bizarre and even intensely positive dream and daydream experiences. So they proposed that sensory-processing sensitivity might underlie the unique symptoms and imaginative richness found in nightmare-prone individuals, and if they can have positive dreams, then this may be a case of differential susceptibility (you remember that’s experiencing both positive and negative more strongly). “Treatment,” then, might simply mean providing individuals high in SPS with more “supportive environments” rather than thinking of them as mentally ill (YES!). It’s nice to see someone looking into this aspect of sensitivity. Having vivid, intense dreams was an item that did not make it to the final HSP Scale but correlates with it significantly. Early in my work as a depth therapist I told my consultant, not an HSP, one of my HS patient’s dreams. He said it was so strange and complicated that she must have made it up! I of course knew she had not, partly because I have had many dreams as complicated as hers. Authors: Jagiellowicz, Jadzia; Aron, Arthur; Aron, Elaine N.
Link: Will post link here when article is available. Thank you for the hope that even just knowing about thsee studies instills! I come from a long line of mental illness and I’ve worked so hard to break the chain of passing down bad coping habits from mymother to my highly sensitive boy. This was very encouraging! into all drug addicts would be useful as people fail to recognise they become addicts because they are in extreme emotional pain. Exactly! Many people blame dopamine or brain chemistry for addiction, but that’s not entirely the case of addiction. Addiction in HSPs could be immediatly fixed if we learned to accept them and stop labeling them as overly sensitive crybabies, or in this case, sick, confused, and hopeless addicts. Addiction is not THE problem, it’s a symptom of a problem. It’s natural from humans to bond with someone, so, in a world were we shun people for being “too sensitive” we create an addict culture of people who bond to activities or substances that provide the feeling they aren’t getting from other humans. A study on rats revealed that, while the previous experiment seemed to prove addiction is due to a chemical hook, it’s largely due to social environments. The case for arguing that addiction is the sole result of the reaction of a drug or brain chemistry in and of it’s own was a rat put into solitary confinement and given 2 choices of water, 1 with drugs and the other without drugs. The rat overdosed and died. Later, another experiment was conducted, and the rats were given a rat amusement park of sorts. They had tunnels to climb through, lots of other rats to play with, and, of course, mate with. The rats rarely ever used to drugged water, and none of them overdosed or became addicts! Thank you for these articles and this website . I have been looking for answers for nearly 40 years to why I was different, to why a touch of another person was sometimes too much and to why the world around me was so noisy and many more. I felt my baby moving in my womb a long before the doctors said it was possible. I feel atmosphere in a room when I walk in, I feel language. Many people would say I always have been just “different”. It’s great to understand why. I’m 72 as well…. always trying to figure out why I feel so sensitive…. it has cost me love and friendship over and over. Wonderful studies. Thank you for sharing! Thanks for these summaries of some very interesting research. It is heartening to see this trait being studied and thus validated by a variety of scientists. I think many of us HPSs must have had my experience of being told, all our lives, that our sensitivitiy was a character flaw or even imaginary. As a former “difficult child” of an emotionally immature mother who blamed and disbelieved me for having strong emotions (even for crying as an infant! ), I have had to spend decades undoing the damage from that early negative environment, a task that was all the more difficult as I didn’t recognize the damage until midlife: I was outwardly successful and told myself I was happy because that was my coping strategy for dealing with my family of origin. The Arons’ research and that of others is providing me with a key part of my strategies for re-conceiving and processing my life experience. Ten years ago, I could not have imagined feeling the peace and joy that I have in my daily life now. Thank-you Elaine: you have touched my life and made it better. Thank you for your amazing work in this field, and for continuing to pioneer and advocate for us HSPs. I discovered the HSP book in 2004 as a 32 year old, and it completely changed my life. I share this information with everyone I know who I think is dealing with an HSP or is an HSP themselves. I really hope the scientific community continues to research and classify HSP as a TRAIT and not a DISORDER. We all need to just celebrate our wonderful diversity. I draw strength from the fact that “I know” and I am so aware … its what makes me feel alive. Self-care and 10 % self preservation is the key in a harsh world (I now look at non HSPs as just not understanding … but that’s o.k. … I feel like I am here to help that situation). I like to think of us all as being a different mixture of the same cocktail. We are all different. Whether physically, neurologically, spiritually, emotionally we are all different, and our environment will affect each and everyone of us differently. I’m at the early stages of my journey with myself and my son … but having fun researching and I really feel like its illuminating my life. Yes its hard, tiring, the meltdowns are sometimes catastrophic, but it’s o.k. At last, I am beginning to understand myself and my family. There are many hurt souls, but understanding is healing. Supporting each other is key, strength and “knowing” there are others is massive. Am an hsp older female with a lot of life. Left to live. Where do I start to get better? My eyes won’tow me to read much in internet. I can be reached at dahodell@gmail.com. Thanks for any help. Thank you so very much for all your work in this field. Like others have commented, I always felt different, and like there was something wrong with me – family constantly teased me for being ‘so sensitive and emotional’ it wasn’t until I was in my 30’s and read your book that I had my ‘aha’ moments – and I am applying all that I read to my highly sensitive daughter – Thank you from the bottom of my heart. Thank you so much for all the work you have done. It has helped me get through areas of my life that were unbearable before. It has helped me to know why I am the way I am. I’m curious as to the relationship of HSP and stress related illness such as autoimmune disease. Also the negative use of things such as alcohol and medication in individuals with HSP for coping with stress. Thank you again! Oh great questions Colleen. I am interested too. Me too! I am HSP & have autoimmune issues. Me too. HSP and autoimmune issues. Also suffered years of psychosomatic symptoms and I’d like to learn how to control that! Thank you for all those summaries. I really like how you noted that most of the studies are on HSP who are struggling rather than happy and centered. The overall results of such studies can produce a distorted picture or incomplete one. I have a request that if possible, a link to the full studies be provided. I do have a background in psychology and rehabilitation counseling so I understand the details of these papers, their usefulness and limitations of the studies done, their implications. It helps me form a more complete picture of what is emerging. I so enjoy reading your books and informative articles. I didn’t know anything about HSP until I went to see a psychologist for help with anxiety and depression and she told me about HSP and to check you out online and take your test and I fit it to a tee. I found out about being a HSP at the age of 59 and I passed on the information to my sister who is also highly sensitive. Thank you so much for filling in an unknown part of my life. I echo Mary Ann Saunders above: what work is being done with aging and sensitivity? Personally, I feel that my trait deepens, but that it also ripens, that is, it enhances my wisdom. I rely on it as a guide as I fulfill the role of an icon of aging (which we elders all are), particularly with children and young adults. On the other hand, environmental noise gets harder to tolerate, and the glaring differences of those without the trait only glare the more! Thanks for all you do, Elaine. I was guided to the HSP descriptor and Elaine’s book five years ago by a knowledgeable therapist and found so many answers in those pages. Last year in an attempt to improve a number of physical ailments, I worked with a functional medicine doctor and had DNA testing. I discovered I had a double variant of the Catechol-O-methyltransferase enzyme that is responsible for the breakdown of dopamine, adrenaline and nor-adrenaline….I’m 25% efficient so I have too much in my system. Researching COMT variants, I found familiar phrases; bright,creative, heightened awareness of surroundings, more reactive, low pain threshold, difficulty performing under stress, and more susceptible to anxiety and depression. Has anyone else had DNA testing done for some reason? and do you have a similar profile? Such great insights Elaine thank you. Looking for an hsp group for teens in southern California. Lots in Northern Cal..not many near Los Angeles?? Please advise if so. I am HSP/HSS according to Dr. Aron’s checklists and have recently confirmed through DNA testing that I have the COMT Met/Met mutation. There are lots of studies on this genetic mutation that suggest traits very similar to those reported in Dr. Aron’s research. I’m currently looking through the studies Dr. Aron has linked here for connections to the COMT gene, but haven’t seen any yet. Her studies are linking Sensory Processing Sensitivity (SPS) with the SLC6A4 gene. I would love to know Dr. Aron’s thoughts on the COMT gene research and how it relates to being HSP. I agree that there seem to be some similarities in how the genetic traits are manifested. Hello! 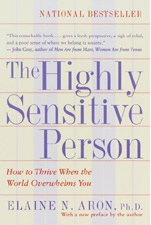 I came upon Elaine Aron’s book The Highly Sensitve Person in my work as a Psycotherapist. And in doing so I saw clearly I am relieved to know I am and embrace being highly sensory. In the past 8 years, Subsequently in my private practice I have used the information to guide clients who have sought help. In particular male clients. I find that there is resistance by males due to their core male cultural beliefs/standards to be considered strong not only physically but emotionally. Therefore being sensitive is seen and felt as weak. Dr. David Wexler speaks and writes about men’s inner struggles with shame and being male amongst other men/society. As does Dr. Holly Sweet. In as much as being female I found absolute relieve and answers and how to go forward, I have become aware of this missing gender piece that two of my male clients have presented. In short, counter transference. I have come on line and digging back into the books I have read to find more male gender specific info when doing the emotional/cognitive work that is required to embrace the HSP tenets/traits. I am so so glad to have found this website! THANK YOU from the bottom of my heart. I am 48 years old and have always wondered why I am different. Why I cannot listen to the news (because it mostly deaply disturbs me). Why I could never watch the movies that others love to watch. I grew up believing that my ‘defect’ was to be too sensitive…. etc, etc. I am blessed with a little girl, now 4 yrs old. My pregnancy was profound and started when I met her soul as she asked to share my body. Of cause I dare not tell this to many people but I kept a diary of all my awerenesses during my pregnancy. I noticed the same traits n my little one, very early and embraised it as I know how good good things can feel but school is a major struggle. I started reseaching and came accross “HSC” – goosebumps – I have not read everything but she (and I) definately fits the “DOES”. Anxiety, stress and depression are considered negative traits, and I think most HSPs probably experience them more than non-HSPs. But I think all of the “negative” traits have counter-balancing positive aspects, and I hope that in the future, the wider society will recognize and celebrate more of the HSPs traits. For example, there is a lot of emphasis on trying to be happy all the time. What about the traits of honesty and depth, which I would argue are just as important over a lifetime. As an INFJ ,hsp, and the rare male of this combination, it’s been more difficult than women hsp’s have it, because I have to hide my emotional responses, for fear of being seen as feminine. I think these are great studies to illuminate why we are this way. People who aren’t hsp’s won’t care, but at least, we can understand ourselves better. in which I cite more of Dr. Aron’s work. It has helped me so much to accept, value, and take good care of myself. As I share it with others, I see a light go on and a look of profound relief. Question: Is there a correlation between incidence of addiction/alcoholism and HSP characteristics? Again, thank you for your valuable work. Thank you Elaine for this and for all the commenters as well. I’m 67 and have wondered all my life what’s “wrong” with me. I wish all this information could have been available so long ago. But now that I’ve found it, I feel I have come home, and I’m learning to live all over again. Now I will no longer be ashamed and afraid to say, “No, that movie is too violent for me.” or “No, I can’t handle going to that big a party.” I feel that I have been given permission to be myself and to stand up for that right. I am wondering if any research has been done with memory issues and HSP. I’m not referring to Alzheimer’s or dementia but the effect the stress of sensory overload can play on memory. As an HSP I also have huge gaps in memory and many of my memories seem foggy and sometimes erased. Maybe does emotion get in the way of logical comprehension? I went through DBT (dialectical behavior therapy) program a couple of years ago and discovered that when I’m in my emotional mind, it is very difficult to be in my logical mind, which for me means I can’t think straight. Three months ago I discovered I am HSP, And now can recall that as a child and young adult I had a hard time comprehending and retaining and I did not then understand why. Now I know it’s because I was operating in pure emotional mode and I had not developed my logical mind yet. I am now able to re-process much of my life with this new awareness and I can remember things I have forgotten. Same with me for sure. I get so worried about my strange memory, or lack thereof. I think maybe because we are processing so many things… that’s it’s too much to remember exactly what happened?? I match with many of the HSP traits. I was also diagnosed with ADD as an adult last year and am responding to Adderall. I’d really like to know are HSP and ADD are often linked? i’m curious if you have at all studied the seminal works of a. jean ayres, occupational therapist (ot) and psychologist, who was the first to research sensory processing and develop diagnostic measures tailored to identifying sensory differences. i see sensory processing as a hot topic in psychology these days, with little to no mention of or credit to dr ayres and the foundational research she put forth. any ideas why this disconnect stands? do you know if there are currently ots working with clinical psychologists to join forces in the continued study of sensory processing? i think it would make for a fabulous interprofessional relationship, since ots have been researching and treating sensory processing challenges for decades. i do hope the readers know that sensory integration therapy is available and commonly used by occupational therapists around the globe, with great success. i am excited to see how the field of psychology will add to what we already know. thanks for this informative website! OMG. What an amazing read. An eye opener and a HUGE weight lifted from my shoulders. I am 64 and yet again in therapy for depression and anxiety having spent my entire life believing there was something wrong with me. An “anxious” child with “apparent shyness” who “needs to develop a personality” according to numerous school reports and “too sensitive” according to my family I now have a possible explanation. Can’t wait to read more. Thank you so much for you work. It has helped me understand my HS self and my HS children and how we respond to the world around us. I am particularly sensitive to other peoples trauma. If it relates to my own childhood trauma in particular, I will often suffer with terrible sleep paralysis nightmares. I was really interested to see this mentioned as I hadn’t heard of the link before between HSP’s and nightmares.. Being able to rationalise all these responses that I have, which are considered irrational by the mainstream, is just so incredibly helpful. Thank you! How do I put myself forward to participate to a study? My profile is quite rare I would say. I am a real contradiction (introvert and extrovert at the same time) and still to this day, do not understand my inner processes. Some insight and clarity would be so useful. Now 45, I have been through all sorts of stages throughout my life as you can imagine. I have thought myself to be bipolar for a long time (bouts of deep depression followed by ecstatic happiness…) but have kind of evolved away from that condition naturally by finding love and try to accept my condition. I have not crossed people reacting quite like me throughout my whole life so I do not think there are many of us. I BLUSH particularly EASILY, at every emotion I encounter, them being good or bad and … there are thousands a day so any understanding of what triggers my buttons would be appreciated. It is very debilitating and real courage is needed to go through every day of life. I laugh when people say they are shy and yet nothing is showing on their face. For me, there is no question : I wear my feelings on my face and need courage constantly to just live. I am NOW accepting this way of being because let’s face it, I do not have a choice but that does not make life easier. A side effect of that is that I get very anxious and angry very easily. I would like to live without OVERREACTING to everything. presentation but I find this topic to be actually one thing that I think I might by no means understand. What if any work is being done on HSP and aging? At 70 I know that I am more deeply attuned to the environment and stimuli; it is worse than even five years ago. Could the fact of having lived a long life thus far in itself be an aggravator with the normal changes of brain aging? Jungian James Hillman in his book on character notes that an irascibility occurs with elders, esp. men. But he does not link it to any pathology per se, rather having one foot in two worlds (the here and fairly soon-to-be there), or even having been there and done that, seen it all, etc. thus causing an impatience and/or irascibility. Thanks in advance for your reply. Thank you, your work is eye-opening! I would love to share your website with my friends. Wow. This is me in a nutshell. It’s amazing, it was so obvious yet I didn’t make the connection. Anxiety, depression, overloaded by stress, hyper emotional, noises, light, wow. I always thought I was broken, now I know I am not. That, in and of itself, is life changing. I answer true to the vast majority of the questions, I am a HSP. Ok but as a middle aged man in the UK what am i supposed to do with this information? I have spent a lifetime suppressing every emotion possible I am not even sure how to let out emotion and if I did it would be overwhelming and who is going to thank me or at the very least not berate or avoid me? I don’t just mean anger, i mean joy and i mean not doing publicly nice things cos i can’t handle the gratitude. In fact trying to avoid publicly doing much at all. I am sure you all know what i mean. I mean really what do i say if not too overwhelmed? “I have a different maladaptive survival strategy to you and its of very little use to me but don’t be breedist and let me do my thing”? I am tempted to just put this to the back of my mind and carry on with my recent (before finding and fully relating to this) optimism that basically says sod it i will try stuff. Grazie per le ricerche e perché aiuti tutti noi elaine. Ho sempre saputo di essere diversa, sin da piccola chiedevo se ero stata adottata, avevo incubi tremendi e sono cresciuta in una famiglia alquanto strana. Crescendo la diversità si notava di più,. Mi chiamavano la straniera ed era ciò che mi sentivo. Tanta ansia, paura e sensibilità, mi definisco una sopravvissuta. La mia sensibilità mi fa sentire i terremoti e tempeste in anticipo oltre a riuscire a leggere dentro le persone.Ora finalmente ho avuto la conferma di ciò che sapevo già ma di cui non avevo conferma. Vorrei che ci fosse maggiore sensibilizzazione e conoscenza riguardo ai hsp per fare in modo che crescano sani e supportati soprattutto in Italia. Mi piacerebbe se ci fosse la possibilità di ricevere informazioni via mail. I was 67 when I discovered that I was HSP. I’ve always known that I was different and now I understand why. Unfortunately, it has not helped me. I’m struggling with everything, including multiple physical/health problems and can’t find the help that I feel I need. I have a counselor that is very good and is trying, but I think about suicide a lot. I’ve become more of a recluse and don’t want to reach out for fear of being judged (even more than before). With all of the turmoil in the world, I’m more afraid on one hand and on the other wishing that the earth would just eject all humans. I cry all the time (even as I write this) and feel so fragile that I wonder what will push me to finally end it all. People that know me tell me how gifted I am with all the creative things I like to do, but it’s not enough! I understand this comment more than any other. I, too, am older. I also suffered my whole life. Now I live in a terrible place and cannot move. I also think of suicide a lot. I look back on things I had to endure just because we cannot close our ears or our noses. The trauma of everything heightened. My family ached to help me. And now, near the end, it was an unequivocal nightmare, just because of a few senses that would not shut up. There is no benefit to this disorder. The only cure for me would have been medically induced deafness. To Carol—-your story touched me. I hope we both can hold on for the people in our lives who love us. It’s difficult but you need to hold on and continue living normally. Seriously don’t even think about the “thing” you mentioned above. There are poor people living on the street, think about how fortunate you are.. There are more positive sides to your trait than negative ones, believe me, you are only focusing on the negatives. Don’t loose hope and faith in God, both of you. Thank you for this. I am new to the HSP community and hope to learn much more. I am 42. I am mostly always anxious as if holding my breath, trying to relax in my own body. People say I look calm but I think I am trying to be safe and control the environments. I suffered trauma as a child and have had years of counselling. I feel like I stared into space alot as a child to escape the environment which was hurtful and scary. I developed a motor neurone illness since sixteen, it was so rare I always wondered if the constant stress made my body self distruct. My family who adopted me dont seem to feel anything and I seem to feel everything. I like to get into nature to feel calm, the shower or bed, playing music or journalling. Talking and feeling understood helps. Accepting who I am is both what I need and what I struggle with as I feel others find me weird. The reality is others like me, and say great things. Its just I am highly sensitive to mood and emotion and project thoughts and ideas of non acceptance on me, when they arnt even there. Its just I dont feel safe much. I have found coping mechanisms and hope to continue to do so. I am curious if any research has been done about relating stress or HSP traits of being easily stimulated and overwhelmed , and the fatigue induced on the neuronal system on the long run, and its relation to Early Onset Alzheimer for 40-50 year olds , HSPs, who are in very good physical shape but suddenly got this disease when no one has expected it.. And aparently from this reason.. A reasearch about linking early onset alzheimer to the HSP genes should be done definitly..How much did HSP negative traits play a factor in increasing the risk and accelerating the process? What can be done for people in this category and not your usual elder ? I think stimulation is definitly bad for them, they easily get tired, angry or stressed, but at the same time they are in the period of their life where they feel the need to be productive so being inactive makes them sad and depressed..